The animals at Maihaugen help to shape the landscape. Photo: Camilla Damgård/Maihaugen. Maihaugen works purposely on its cultural landscape and takes part in organised conservation work to preserve threatened species of farm animals in Norway. At the museum this work gives the opportunity to illustrate the local animal husbandry and exhibit how the animals shape the landscape. At the same time we show the public how people of all times have shaped the landscape around them. Grazing, harvesting leaves, hay making and felling of timber created special cultural landscapes that are disappearing today due to modern agriculture. This is why Maihaugen does not just preserve houses and articles. 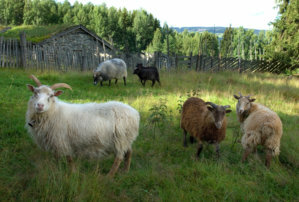 You can also find species of farm animals and plants that were usual for the area of Gudbrandsdalen at the museum. This is important conservation work, together with the exercise of traditional agricultural methods. The cultural landscape is also characterised by how the cultural pastures and the cultivated ground are separated, with fields and meadows. How roads are placed in the landscape is also a part of the cultural landscape, and the same applies to the various types of fences such as picket fences and stone walls.